My new Gracie Queen quilt frame arrived Friday afternoon, it took hubby and I four hours to assemble, the instructions were clear and concise and all components were accounted for. Unfortunately when we put the carriage on the rails, it fell off where the crib and queen sizes met. We loosened the frame, adjusted and re-tightened to no avail despite using a square and level because the aluminum rails were off by meer millimeters. 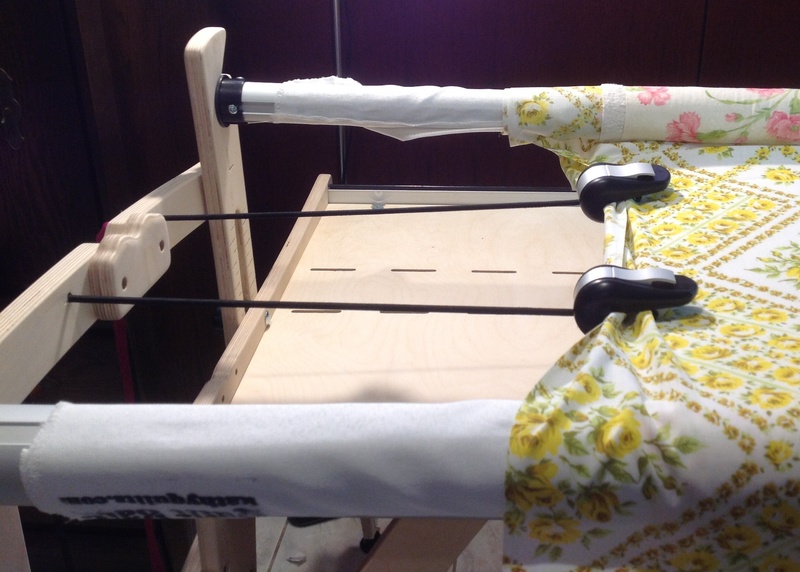 Our resolution was to remove a washer from two of the rear wheels on the carriage so when the frame expanded, the carriage, with the weight of the sewing machine, had enough play to stay on the tracks. The original 8 foot plastic tracks which you insert into the aluminum however, were damaged in shipping, they are made of a hard plastic and were crushed under the weight of the frame so that they kept popping out of the aluminium rails. Hubs replaced the portion of damaged track with the 3 foot crib pieces but it causes a problem when you move the crib over the joint. I’ve requested new tracks be sent. Once we got the carriage problem worked out, I used old poly/cotton sheets from the cottage for practice as well as a flannelette sheet for mock batting. 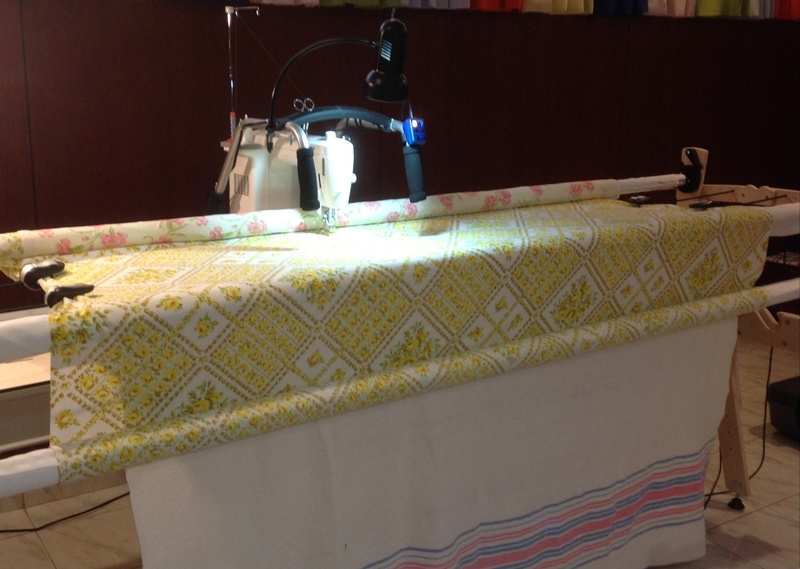 When I first put the backing sheet on the rails, there was no tension, when I tightened the takeup rail, the backing rail would simply follow so I’d have too much fabric hanging between the rails. It wasn’t until I added the batting and top that everything tightened up — almost too much now. When I want to advance the quilt, I have to first loosen the top then the backing and make sure to lift the batting up for slack. I hated pinning the quilt to the leaders. A little while ago I found a video on YouTube by Sharon Schamber about velcro leaders, makes life so much easier. I posted this on Kathy Quilts’ forum but the moderator argued against it repeatedly. I’m going to make velcro leaders as soon as I possibly can because if I have to waste time doing that again, I’ll scream. Also, I had mentioned the side leaders which makes a heck of a lot of sense. 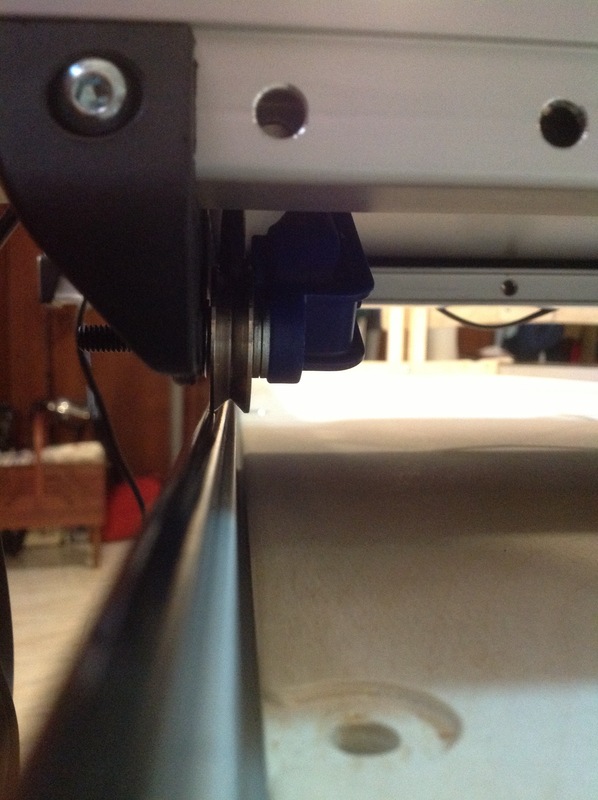 Not only does it eliminate the problem of running into the side clamps, it also gives the sides even tension. Again, the moderator argued against it saying that the new Grace Company side clams were better. I beg to differ, strongly. Finally, at long last, I got to sew! The Juki TL-2000 Qi is awesome, I really love it, you have to treat her right though. Check your bobbin tension often, she HATES Gutermann thread, shreds it and creates ugly nests. I had to switch to a finer thread. I loaded the bobbin with Superior Threads’ Kimono Silk because I know one bobbin will last and last and last and swapped out the Gutermann with some left over Aurifil in dark grey. She was happy as a lark, humming and sewing beautifully. In addition to the Gracie Frame, I also purchased the SureStitch Stitch Regulator which, IMHO, is grossly over priced — $559.95 from The Grace Company. The plastic feels über cheap but regardless, it works – so far. You attach sensors to one of the wheels on each of your upper and lower carriages so it speeds up and slows down depending on your movements. The stitch regulator on my Bernina is much more sophisticated but I don’t know how other stitch regulators work on longarm machines so I really have nothing to compare it to. 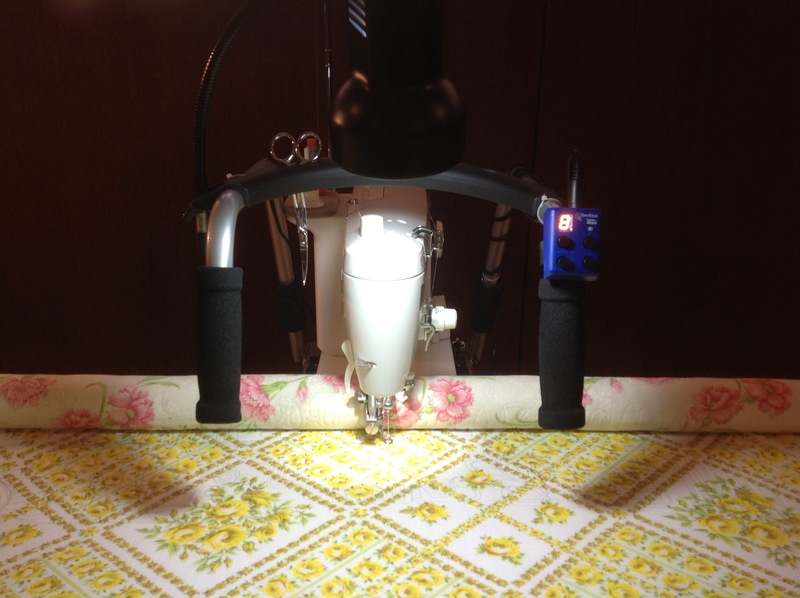 Free Motion Quilting using a Juki TL-2000 Qi on a Gracie Queen quilt frame IS better than wrestling a quilt over your shoulder/lap/sewing machine throat.! MUCH easier!! This set-up isn’t perfect but it is better than nothing. The carriage moves relatively smoothly but when I attempt to create swirls and circles, the carriage wants to make squares or something between a circle and square. However, the more I practiced, the better I got. 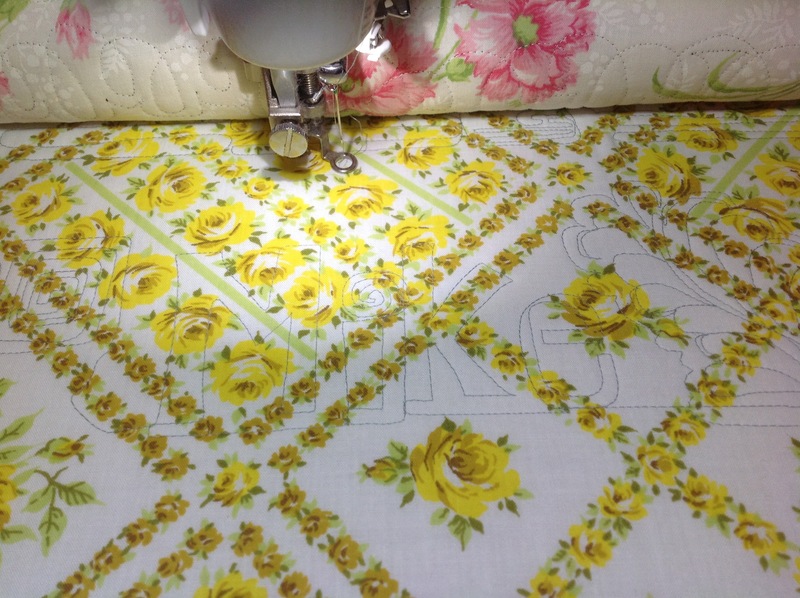 You really do need to learn free motion quilting all over again. The machine moves so easily and is more challenging to control and if you go too fast, the frame starts to rattle, vibrate and shake. With this particular set-up, I find it easier to quilt straight lines, boxes, stone walls, etc… Although I’m going to continue practicing curves and swirls, I will change and hone my style to work with this carriage. I may look into other carriages further down the road. One thing you never read about with longarm or shortarm set-ups is the mess behind the machine. Each component you add to your kit requires electricity; 1. sewing machine; 2. lamp; 3. stitch regulator. 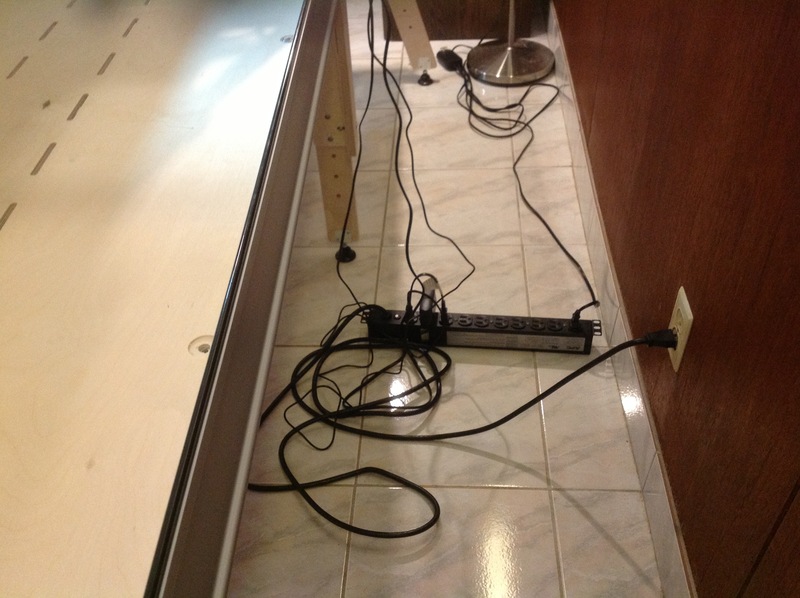 And the cords must be long enough to reach from one end of the machine to the other. Something to think about if you choose to go this route. For my preliminary summary, I would say that the Gracie Queen quilt frame set-up is no walk in the park and certainly not a picnic to get up and running. It’s not a simple matter of putting it together and sewing straight away, you have to make adjustments, tweaks and realize the possibility that something might get damaged in shipping. After all, aluminium is pretty flimsy and easy to bend, unlike steel. The wood on this frame is not finished, there is no wax or lacquer. My first choice was the Grace Start-Right frame which is all steel but The Grace Company would not ship it to Canada “because of costs” but they would ship from Utah to Main. Go figure, this makes no sense to me, especially when I’m paying the shipping/duties/taxes!! I was told that the wood would not be affected by conditions in a basement but I have my doubts. Only time will tell. Kathy Quilts included a goose neck lamp, 30 bobbins and 50 universal needles to my purchase for which I am grateful though I don’t think I’ll be using the universal needles opting for Superior Threads’ Topstitch needles which have a larger eye. This review is an account of my personal experiences, thoughts and opinions. This entry was posted in Juki, Shortarm Quilting and tagged Aurifil thread, Gracie Queen quilt frame, Gutermann, Juki TL-2000 Qi, Quilting Side Leaders, Sharon Schamber, Superior Threads, SureStitch Stitch Regulator, The Grace Company, Velcro Quilt Leaders by Tabatha. Bookmark the permalink. Looks like you just have a bit of a learning curve ahead of you! The swirls will come. I have a Hinterberg frame with a Juki and it took a while. My Juki and I have a love/hate relationship. When it’s good, it’s awesome. When it’s not, I want to tear my hair out! 🙂 But since I’ve learned a little bit more about thread/needle combos, I’ve had a lot less trouble. Just enjoy the process!!! Hi Candy, thanks for commenting!! My thread is shredding like mad today, I now realize that I can never use Mettler or Gutermann in this machine, fine thread only. Have you also experienced that? Also, what do you typically keep your tension at? I’ve tried several different needles and rethreaded repeatedly. HELP & THANKS! I’m at work right now (I know…I should be working!) and I don’t remember settings. I’ll check it out when I get home. I’ve recently used just Superior threads for quilting…So Fine. Let me think about it and I’ll get back to you. I haven’t used it in a few months. I have a Juki TL98E…don’t know if that makes a difference. Right now the tension is at 3. It worked beautifully last time I used it. I may weld the the tension disk to keep it that way! 🙂 I also found that some of my problems were with how tight the quilt was on the frame. I mean that if I had it tight like a drum it didn’t quilt as well as if I loosened it a bit. If I took the machine off the frame it stitched like a dream. It was a nightmare on the frame. Eventually, I played with it long enough that I got it to quilt well. Just play….it’ll come to you.